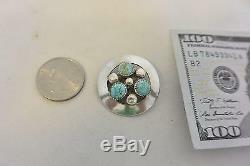 Frank Patania Thunderbird Shop "Triple Number Eight Turquoise" Pin. Signed with the correct "Thunderbird", "FP", and "STERLING" Hallmarks. 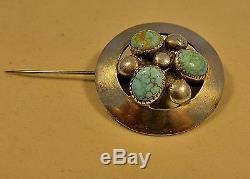 The Patania Thunderbird Shop "Triple Morenci Turquoise" Pin. 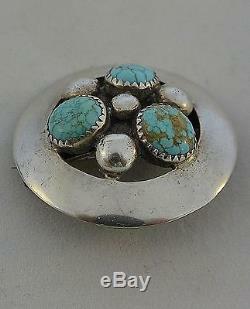 This wonderful Number Eight Mine Turquoise Sterling Silver Pin was made in the famous Frank Patania's Thunderbird Shop. 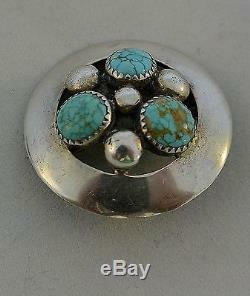 It is properly hallmarked with the Patania Thunderbird stamp, "FP", and marked "STERLING". That would possibly date it to the 1940's. It is most likely newer than that. Please See the Link Below. The Number Eight Mine Turquoise stand proud in contrast to the four Sterling Silver raindrops and the surrounding mirrored surface. 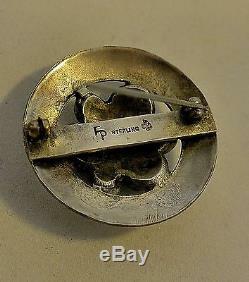 A note about Patania and Thurderbird Shop Hallmarks. Has been living in Tucson, Arizona with his wife Donna for many years. I visited with them recently and Frank was kind enough to take the time to share his portfolio of pictures with me. It contained pictures of major pieces of jewelry, and everything from religious articles, to contemporary bead work. I also saw recent jewelry creations that ranged from a primitive tufa cast ring (that just happened to fit me perfectly) to a ring that would be quite cherished by the head of state of Vatican City! Frank kindly took the time to clear up some misunderstandings that I have shared with other members of the jewelry collecting community. Donna and Frank encouraged me to spend some time becoming familiar with an article Frank Jr. Wrote in August of 1992 in collaboration with other Patania family members in an effort to set the record straight on the use of various Hallmarks by his family. He assured me today that it is, "Subject to revision in the future" but is the best source that there is, or as Frank says in the article, "I believe that we are the most qualified to present the history of our hallmarks". Here is the link to an informative and entertaining story written by Frank Patania Jr. A History of the Patania and Thunderbird Shop Hallmarks. Frank Patania was born in 1899 or 1900 in Mesina, Italy. He came to New York about 20 years later and became infected with Tuberculosis in his early 20's and then moved to Santa Fe, New Mexico for the perceived theraputic environment of the dryer Southwest. In 1927, he opened his "Thunderbird Curios Shop" that later became the famous "Thunderbird Shop". He ran it with his wife Aurora. 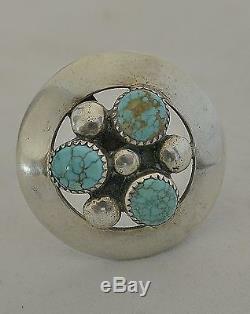 As a jewelry designer, his move to Santa Fe was quite dramatic for him. Patania established a style of handcrafted Southwest American jewelry by blending European silversmith technology with Native American design, a combination that would provide a foundation for excellence in style and artisanship. In 1937 a second "Thunderbird Shop" was opened in Tucson, Arizona. In 1964 Frank Patiania Sr. Died and the Santa Fe shop closed. It was reopened by his son Frank Patania Jr. Had a son named Sam in 1959 and he still lives in Tucson. All three Patania's works are on permanent display at the Smithsonian's Renwick Gallery and are well represented in many collections. Franks Patania's work was a favorite of Georgia O'Keefe, for instance. I'm proud to live in Tucson myself and enjoy the Frank Patania tradition as carried on by Frank Jr. Michael Contreras, Carlos Diaz, and Sam Patania. With such now famous and influential artists as Charles Begay, Joe H.
Quintana, Julian Lavato, Alberto Contreras, Mark Chee, Jimmy Herald, Lewis Lomayestewa, and others working for and with him, I can only imagine a creative environment that would not be found elsewhere in modern times. 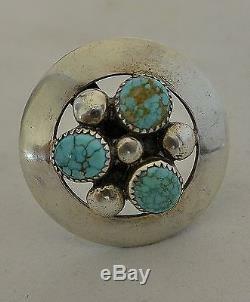 My personal opinion is that the influence of this American-Italian Master on 20th Century Native American jewelry is as profound and impactful as that of anyone. Many look at the influences of such artists as Charles Loloma and Kenneth Begay and their role in the direction of contemporary jewelry. It was Frank Patania that made the craft and design disciplines a part of Native American contemporary jewelry and brought it to a world-wide audience that is still receptive to innovation and art. I have found no defects like noticable scratches, etc. I believe that you will be pleased! 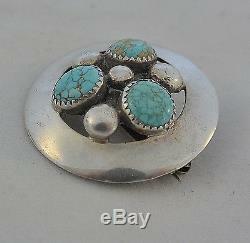 This amazing Pataina Thunderbird Shop Pin is full of character and will be recognized by many people. When you take a look at the pictures, please inspect the Pin carefully for the fine detail in both design and execution. 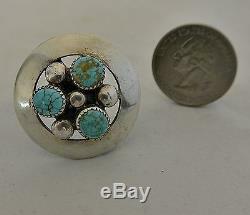 Like all Jewelry that originated in the famous Thunderbird Shops, it is very well made. Your friends may compliment you and your taste in Patania jewelry. If you like this, consider it an opportunity as this is not a Patania design that I have seen available in some time. Recomended Reference Books - This artist is referenced if there is a page # shown below. "AMERICAN INDIAN JEWELRY I" - Gregory Schaff. "AMERICAN INDIAN JEWELRY II: A-L" - Gregory Schaaf. "HALLMARKS OF THE SOUTHWEST"- Barton Wright - page 131. 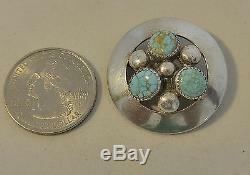 "THE LITTLE BOOK OF SOUTHWESTERN SILVER" - Billie Hougart - page 261. "ZUNI THE ART AND THE PEOPLE"- Bell- Volume 1-3. 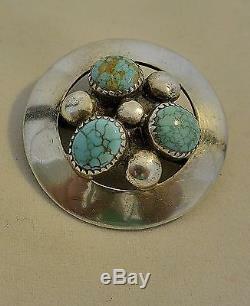 The item "Signed FRANK PATANIA PIN Brooch with3 NUMBER EIGHT MINE TURQUOISE Sterling Silver" is in sale since Friday, May 26, 2017. 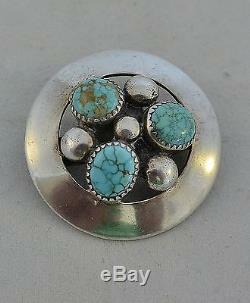 This item is in the category "Jewelry & Watches\Ethnic, Regional & Tribal\Native American\Pins, Brooches"." and is located in Tucson, Arizona. This item can be shipped to United States, Canada, United Kingdom, Denmark, Romania, Slovakia, Bulgaria, Czech republic, Finland, Hungary, Latvia, Lithuania, Malta, Estonia, Australia, Greece, Portugal, Cyprus, Slovenia, Japan, China, Sweden, South Korea, Indonesia, Taiwan, Thailand, Belgium, France, Hong Kong, Ireland, Netherlands, Poland, Spain, Italy, Germany, Austria, Russian federation, Israel, Mexico, New Zealand, Philippines, Singapore, Norway, Saudi arabia, United arab emirates, Qatar, Kuwait, Bahrain, Croatia, Malaysia, Chile, Colombia, Costa rica.